Performed in darkness, lit only by moving LED candles, Distance Measures (2012) borrows elements from mathematical models of chaotic systems. This beautiful, highly structured dance improvisation evolved collaboratively alongside Derek Bermel's Orbit Design, a musical algorithm inspired by the three-body problem in celestial mechanics. 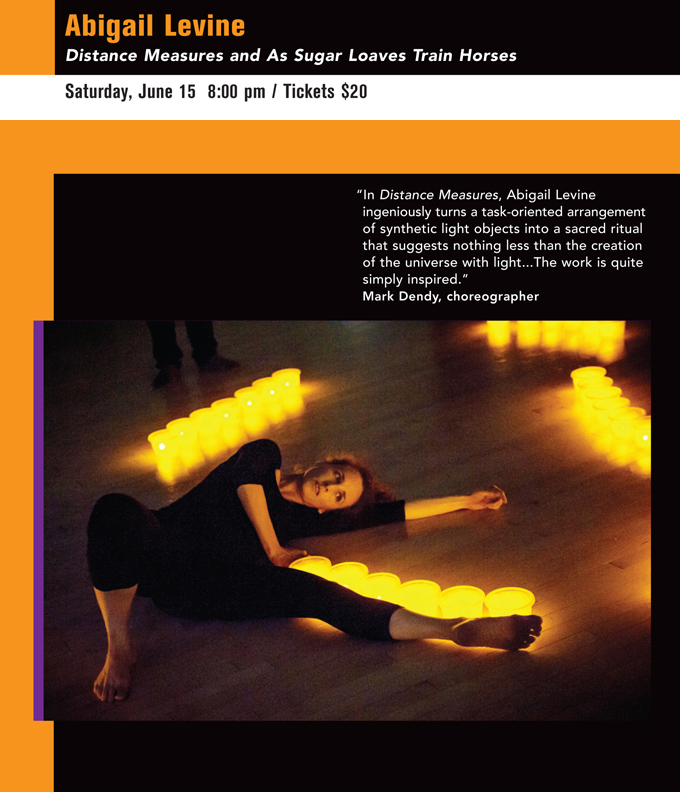 Choreographer and performer Abigail Levine brings together the rigors and resources of dance's bodily specificity with performance art's experiments with time and human action. She has presented her works in the US, Cuba, Brazil, Venezuela, Mexico, and Taiwan. Composer and clarinetist Derek Bermel is Artistic Advisor to the American Composers Orchestra and is currently in residence at the Institute for Advanced Studies in Princeton, NJ and the Los Angeles Chamber Orchestra.